I'm sure this sounds strange to some of you, but Endless Ocean 2 is one of my most-anticipated games for 2010. The original, released in early 2008, is one of my favorite Wii games, and all signs point to the sequel besting its predecessor in every way. "Endless Ocean 2 features improved graphics and larger explorable areas than the previous game. 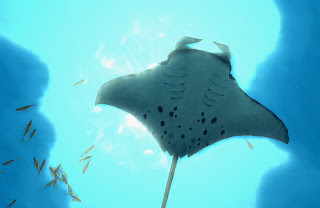 In contrast to Endless Ocean, which featured a single location, Endless Ocean 2 allows players to travel to six different diving spots around the globe, including new polar and river locations. The plot of the game involves a woman named Oceana and her search for an artifact called the Dragon Stone, but players will be able to ignore it or follow it at their leisure. "The ability to dive with a dolphin as a companion returns from the first game, and players will now also be able to ride them to quickly move through the water. Players can also sell salvaged treasure for money that can be used to buy items to decorate reefs and aquariums. Potentially dangerous creatures such as sharks and crocodiles will now illicit a warning for players and may even attack them; players will be able to drive them off using a new tranquilizer-like tool called the Pulsar, which calms them down. "The game features online co-operative multiplayer that allows communication using the Wii Speak peripheral. As with the first game, players will also be able to take pictures during their dives, which they can now save to an SD card." For a glimpse of the Japanese version of Endless Ocean 2 in action, head over to the always-fabulous WiiFolder.com and watch a series of gameplay videos that have been posted by cutie patootie Josh Thomas. I really wanted to play Endless Ocean, but I never found it cheap enough to warrant buying, and none of my friends had it. I might just buy the sequel. I'm thinking it could help me get over my fear of water levels in video games...blech. It's too bad Nintendo didn't price the first game at $29.99 - and promote it a bit, of course. I'm not saying it's not worth $49.99 - it is, most definitely - but I think it would have caught the attention of many more gamers (especially of the casual variety) had it been more of a "budget release." Unfortunately, it looks like the sequel will be $49.99, too. Considering how much better it's supposed to be than the original, though, I'm sure it'll be well worth the price of admission. Enough about that, though - what's this about you having a fear of water levels in video games? Do they actually bother/scare you, or do you hate how they tend to control, etc.? So, you didn't like the first one? Why not? I thought it was pretty great for what it was, though I have to say the sequel looks even better. Sadly (for you), I don't think the sequel is supposed to be released in North America until early next year, though it sounds like you're open to buying the Japanese version? NieR Replicant to feature a futunari?